Now in its 23rd season and founded in 1994 by David Anderson (longtime theatre activist, producer of new Canadian work, and defender of public space), Clay & Paper Theatre’s mandate is to create, develop and perform multi-disciplinary, community-driven theatrical works using narrative theatre and large-scale puppetry in public spaces for large and diverse audiences. 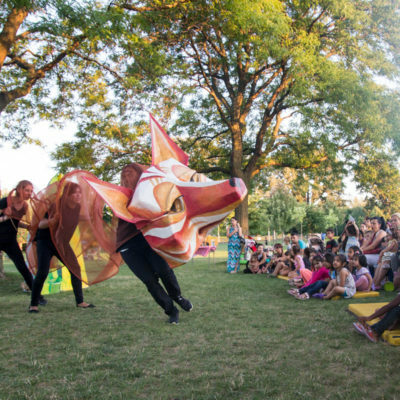 Clay & Paper Theatre produces plays, pageants and parades with the community, grounded in the idea that performance in public space is an act of cultural transformation. Their practice of building, rehearsing, and performing in full public view is an attempt on our part to “bring back the commons,” reunite art with the daily life of the community, and to make art accessible to all.